A specially decaled Kenworth T680 undertook an important mission this fall – transporting this year’s U.S. Capitol Christmas Tree some 3,000 miles to 10 community celebrations en route to the tree-lighting event in Washington, D.C. The Kenworth T680’s distinctive decal design was unveiled Oct 12th in advance of the Oct. 27 tree-cutting of the 2015 Capitol Christmas Tree near Seward, Alaska. The design features the Chugach Mountains and the U.S. Capitol beneath a northern starry sky with the words “From the Northern Lights to Capitol Lights.” It also includes the 2015 Capitol Christmas Tree official seal, a map of the tour route across the United States, and the Alaska state logo of Lynden Transport, a long-time Kenworth customer based in Anchorage. 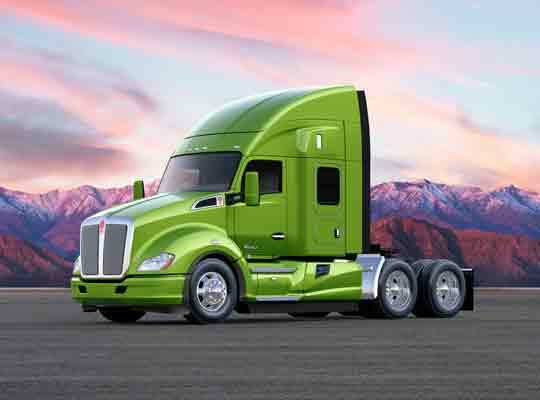 The T680 was made available for the tour by PacLease, which provides customized full-service lease, rental and contract maintenance programs featuring Kenworth trucks. The 2015 U.S. Capitol Christmas Tree is a 74-foot Lutz spruce, which will be shipped from Anchorage by Totem Ocean Express to the Port of Tacoma. Lynden Transport driver John Schank, who has logged more than 5 million miles on the treacherous Dalton Highway between Fairbanks and Prudhoe Bay, Alaska, will then pilot the T680 from Seattle on its 3,000-mile journey to the nation’s Capital. The T680 will pull a trailer specially designed for the Capital Christmas Tree. The T680 76-inch mid-roof sleeper is equipped with a fuel-efficient 485-hp PACCAR MX-13 engine with 1,650 lb-ft of torque. The truck also features a reliable Eaton Fuller Advantage 10-speed automated manual transmission and Kenworth TruckTech+. Kenworth’s 76-inch mid-roof sleeper is optimized for liquid bulk tankers, flatbed haulers and other truck operators that prefer a lighter weight, more aerodynamic truck combined with all the comforts of a high-roof sleeper for driver retention and recruitment. The tour will also include a stop at Kenworth’s Chillicothe, Ohio, plant, where the truck was built, plus a community event in Chillicothe on Tuesday, Nov. 17. For more information, visit the 2015 U.S. Capitol Christmas Tree website (www.capitolchristmastree.com). The public can track the truck’s progress at Trackthetree.com.